Click on a city to learn more. TestAvoid the fast life and retire in Nebraska, a state with scenic views, quiet cities and towns, and the peaceful living that you’ve worked so hard all of the years to now enjoy. Whether you want to rent or buy, purchasing a home in Nebraska is affordable and costs of living in the state equally matches the affordability. The state is also home to great affordable healthcare for its residents, ranking 10th in the U.S. for lowest costs. Retirees that choose to retire in Nebraska do so to take advantage of the amazing outdoor opportunities provided. You'll find yourself seldom staying indoors when you’re surrounded in the breathtaking beauty found throughout the state. 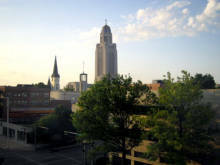 Scroll up to see some of the best places to retire in Nebraska!